Beautiful Vacation Apartment - Hertzlia Pituach! Two bedroom - Duplex apartment BEST VALUE! Beautiful and fully furnished apartment in Hertzelia. 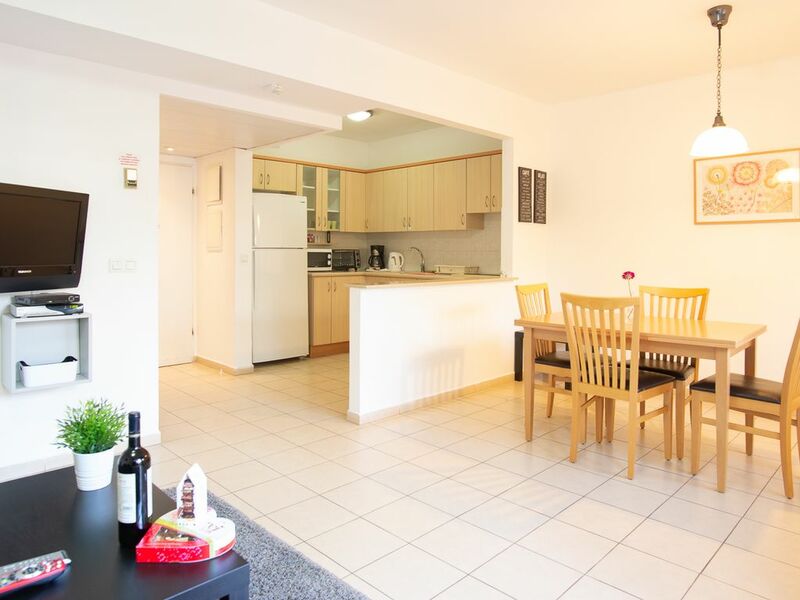 The apartment is spacious and especially designed to accommodate you and your family during your stay in Israel. Feel at home in our apartment, with a fully equipped kitchen, towels and linens, and a beautiful terrace to enjoy. Our two bedroom apartment is located in at the Regency Gardens. The building has a 24 hour doorman, including a full size outdoor lap swimming pool for you to enjoy. Our service Representatives will try to accommodate your need (high chair, baby crib, Shabbos blech, cell phone etc.) so you can enjoy a warm and amiable stay in our apartment. Located a 1 minute walk from our apartments! We provide FREE indoor parking during your stay with us (you will get a remote control to open the gate to the parking lot and a designated parking space). There is 1 TV located in the living room only. Wonderful stay! Excellent location. Very clean and spacious apartment. Very helpful and friendly staff. Exceeded all of our expectations. Thank you!! Simply excellent. Great view and very modern. - both booking staff and in country reps were very friendly and attentive. - all the extra features one needs: good tv, DVD player, free wifi, iron, cooking equipment and crockery, towels, extra duvet, safe, bottle of water waiting and tea bags. - the hotels amenities were also excellent including indoor and outdoor pools and nice lobby cafe and restaurants. - once weekly cleaning service should default be midway through a week stay rather than penultimate day though I could have arranged a specific day so really my fault. Beautiful studio apartment with a spectacular beach view! Great indoor pool and local beach was so nice! Would highly recommend! 10% discount 7 days or more 15% discount for 30 days or more 5% returning guest discount *We have different seasonal rates (standard, high and peak). Contact us for availability and rates!